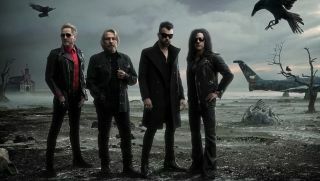 Deadland Ritual Share Debut Song, "Down In Flames"
Supergroup featuring Geezer Butler, Steve Stevens and Matt Sorum to play debut shows in June. The supergroup will play their debut show in June. Video: Slash and Kings of Chaos Perform Guns N' Roses' "Mr. Brownstone"
As we reported last week, Kings of Chaos — a supergroup featuring former Guns N' Roses' members Slash, Duff McKagan and Matt Sorum — performed a benefit show in Los Angeles November 18.